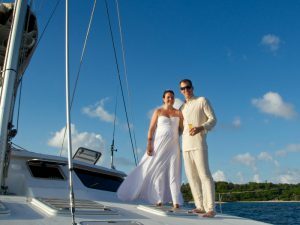 Zanzibar Yacht Weddings Honeymoon on a Luxury Catamaran Yacht. 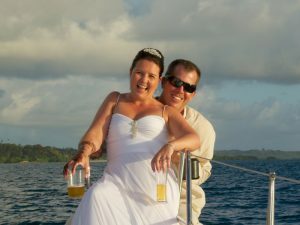 Here at Zanzibar Yacht Charter, we have the perfect solution if you are planning Zanzibar Yacht Weddings Honeymoon. PLAN YOUR WEDDING OR HONEYMOON ONBOARD ONE OF OUR BEAUTIFUL YACHTS! A wedding celebration should be magical. Imagine combining it with the unforgettable experience of an island yacht charter. Uniquely there is probably nothing more romantic than a couple starting their lives together with a tropical island-style wedding and/or honeymoon! You can get married at sunrise or sunset! Likewise under a balmy tropical night sky, filled with more stars than you can ever imagine! As a matter of fact, what better way to start your marriage (and relax from your wedding), than by enjoying a honeymoon yacht charter in the incredibly romantic destination of Zanzibar! Furthermore, choosing a luxury yacht charter for your honeymoon is perhaps the most romantic experience for a newly wed couple. You can cruise to secluded bays. Walk hand in hand on deserted beaches, dine in candlelit seaside restaurants or visit a new romantic destination every day. Your first important voyage together is best on a yacht! You will be able to relax, swim, sightsee and sail away into the gorgeous sunsets. All this while being pampered by an attentive crew. Furthermore, they will make sure you have everyting you need and also all the privacy you need for this most special of holidays! Experience the ultimate in luxury and privacy with a Honeymoon Yacht Charter… You deserve it! Conveniently departing from Nungwi Village on the northern tip of Zanzibar or Stone Town. Imagine repeating your vows while standing barefoot on a white sandy beach with turquoise blue water as your backdrop. On the other hand, maybe your style is more adventurous. How about standing on the deck of a beautiful, luxurious catamaran yacht? All decked out in tropical flowers as you exchange your vows? How about taking your Bachelor or Bachelorette Party, Wedding Shower, or your friends out after the wedding as a Reception Cruise on one of our beautiful yachts? 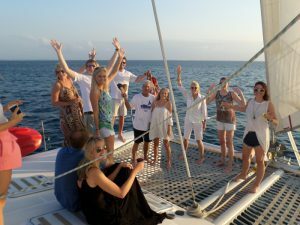 Many Zanzibar Yacht Weddings Honeymoon planners use our spacious sailing catamarans or power yachts. Especially for pre or post wedding parties for friends and family members. Do you need something to entertain your guests that are visiting here for your wedding? We can take them cruising prior to or on the day after your wedding. You may also choose to include activities such as snorkelling, fishing, an on-board dinner or a beach BBQ. Whatever your group would most enjoy, we will make it happen. Creating memories is what we do best! Let us put you in touch with our wedding planners!